Petunia plants typically are grown from seeds and bear flowers in pink or purple hues. 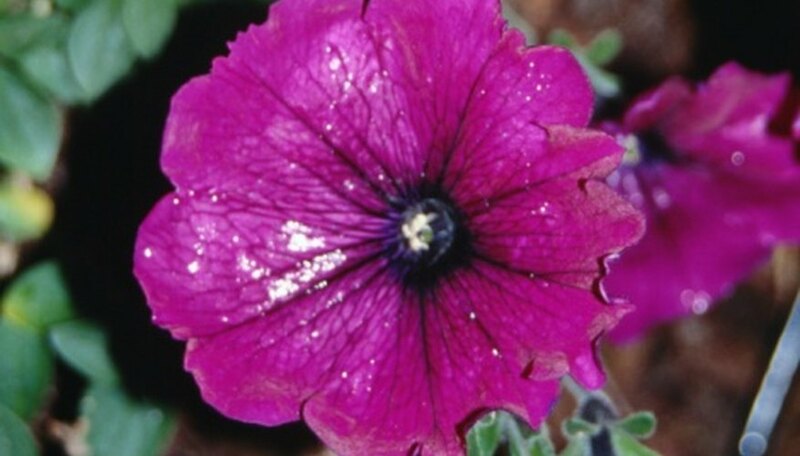 However, petunia seeds can be challenging to handle because they are so small, about 250,000 to 300,000 seeds per oz. You should start seeds indoors about 10 to 12 weeks prior to your area's last average frost date. The germination of petunia seeds occurs correctly if you choose a well-drained, pasteurized medium that is moist. Purchase a commercially prepared mix. In addition, use a container that is clean and has holes in the bottom to allow excess water to drain from the medium. If you want to use a previously used container, wash the container in soapy water and disinfect it by placing it in a mixture of nine parts water and one part chlorine bleach. Fill the container until the growing medium is about an inch from the top. Place the seeds on the surface of the growing medium and press them into the medium gently using a pencil. Water the seeds with a fine mist, or place the germination container in a shallow container of water. Do not cover the seeds when sowing them. Also, place the germination container in an area in which the seeds will have access to bright light but not direct sunlight until the seeds begin to germinate. Direct sunlight creates high temperatures that can prevent germination. Keep the temperature of the petunia germination medium at about 70 degrees Fahrenheit, making sure the temperature does not go above 80 degrees Fahrenheit. Cover the germination container with a plastic bag or clear plastic food wrap to keep the soil from becoming too dry. Take off the plastic bag or food wrap when seedlings start to appear. Let the growing medium become slightly dry between watering times, but avoid letting the seedlings wilt. Apply starter fertilizer to the seedlings according to the manufacturer’s instructions. Keep the seedlings in sunlight or under fluorescent lights that are six inches away and stay on for at least 12 hours daily. The temperature should be between 60 and 65 degrees Fahrenheit. After petunia seedlings begin to bear at least two leaves -- or in about two to three weeks -- put the seedlings in individual peat containers or in growing trays. Make sure the containers are free of disease and the growing medium is sterile. Keep the seedlings at about 65 degrees Fahrenheit, and give them 1 oz. of 20-20-20 fertilizer mixed with 3 gallons of water every couple of weeks.